Pardon me for all Anthony Trollope fans who happen to read this post for what I am going to say may not be in line with your opinions but I’m saying the truth anyway. Although I prefer ‘The Warden’ to ‘To Kill A Mockingbird’ in previous post, I must say the former falls short of my expectations. I know this is subjective and many will oppose my ideas of comparing ‘The Warden’ with some of my most-beloved titles but surely I have to use my own standard to decide whether of not ‘The Warden’ is really good or not according to MY OWN VERSION. As I have often said in this blog, a story method is really important to me. I highly value beautiful words, very detailed descriptions and such in SHOWING KIND OF WAY. Not only this method allows my mind to wander, create its own kind of world, I feel so satisfied with this kind of beauty. I believe writing is an art. It’s the kind of human invention that not only feeds your mind but also more importantly entertains your soul. Sadly to say, I don’t get emotionally nourished while reading ‘The Warden.’ I love its grand idea, the moral lesson it has conveyed but I have to admit the book has failed to give me a beauty. It’s too direct, I feel like I am so easily guarded while as a matter of fact I can guide myself, find another satisfaction other than the messages of the novel itself. I have expected the book would present me with tiny details on people at that time, landscape background, more information about minor characters but I don’t get as much as I have wanted. The book is too wise as well, particularly about Mr. Harding and John Bold, whom I describe as too perfect fictional characters. I am not a Victorian literature expert or so but after reading a number of really great titles mostly by Thomas Hardy, I sadly say ‘The Warden’ is well below Hardy’s works. 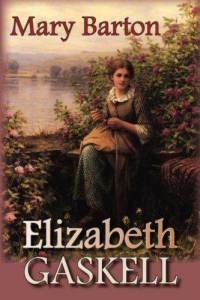 Again, this can be so subjective but Hardy’s works or Elizabeth Gaskell’s are much more … satisfying, whatever that means to each and every reader. But the wholeness sensation that follows after completing reading their books is beyond words to express them all. Although I prefer Hardy to Gaskell in general, Gaskell’s ‘Mary Barton’ is such an exception in terms of language. By that comparisons, I brutally honest conclude ‘The Warden’ is a flat reading. May be I should read another Trollope’s title but given the first plain reading experience with ‘The Warden’, I am not going to give a second try to read his another work, at least for the moment. The quiet life of the Bartons family changed into a grief, perplexity when their relative, Esther, mysteriously vanished without a trace. Her dissipation triggered a discussion between two best friends, two laborers, John Barton and George Wilson, as the novel begins. Not long after this incident, Mrs. Barton dies, leaving John with no one to blame, except Esther. So, John, who had lost his son, Tom, now survived with his sole daughter, Mary Barton. Being an orphan made Mary turned into a hardworking girl. She ended up working at Miss Simmonds’s dressmaking house. Her nice, beautiful countenance helped the employee gaining many customers, some of whom, according to Mary’s friend Sally Leadbitter, came to the house due to Mary physical apperance. John Barton got more involved with Trade Unions as workers condition in the city was getting more unbearable. Dying people due to hunger, wandering kids in search for bread were so commonplace. As her father was busy with his workers association in search for better lives from employees, Mary befriended with Margaret and her grandfather Job Leigh. Mary also got closer with Alice Wilson, the aunt of the former’s pal, Jem Wilson. Alice was suffering from deaf while Margaret turned into a blind girl, though, fortunately her angelic voice saved her and Job from poverty thanks to her singing career. So many sombre events took place afterwards. John and his fellow mates from the union set a journey to London in a hope they would be given a parliamentary session at the House. They, of course, wanted to talk to legislators on their hard times, unfair wage treatment and such till they would see brighter lives after that. In the meantime, dark clouds were hanging in the roofs of the Wilsons family. Jem’s twin little brothers dead. No long after that, George dead, too. There remained Jem and his mother Jane. Mary, who had long been suspicious with Jem’s unusual behaviors to her, found herself got torn between friendship and romance with Jem. He, who had been her long mate, acted so weird when Mary paid a visit to his home to state her mournings in regards with the death of the twins. Jem couldn’t help being a bit joyful when Mary came then talked to him but his strange attitude with the touch and kind of thing somehow pushed her away. The closeness between the two caused her to initially abandon any thoughts of making their relationship into a love affair. So, Mary rarely talked to him, affirming that they remained friends. Jem, on the other hand, kept approaching her till he was sent away when he declared his true love and marriage intention to Mary. By the time Jem left her house that was when Mary realized she loved him as much as he did. But Jem had gone, her regret couldn’t change the way that had just happened. How feeling turned her life upside down. Just when she discovered Jem was she ever wanted, she had to pay what she unintentionally did to Mr. Harry Carson, the son of John Carson who owns a mill in the city. It was Sally, Mary’s coworker, who served as Harry’s messenger. John was so submerged with the failure the union mission in London. They failed to voice their ideas to the parliamentary. He was carrying a great burden over his shoulders when he got home and this lasted for so long that Mary hardly recognized the father, who had been so kind and tender to her. John easily got angry. He even hit Mary. He spoke coarsely. The fact that he was out of job completely dragged him away. After apologizing to Mary for his rude behavior, John’s mind seemed to have wandered away from his daughter. While Jem gradually took distance from her after the rejection moment, Mary found herself in a shocking complicated love triangle story when Sally took her to meet Harry Carson. Although Mary felt sorry for admitting what she did to him was a mere giddy flirting, Harry did not give her up. He even wanted to marry her. But she pushed him away since she did not love him. The secret meeting was over, leaving Mary with overwhelming thoughts. After she met and told her feelings to Margaret, she felt so relieved and went ahead with her best friend advice not to boldly admit her true feelings to Jem but approached his mother instead. The relationship between employees and workers in the city grew worse. The working class people protested against relatively small wages they received despite the hardworking they did. As such, John decided to go to Glasgow to pursue the equality between both parties. He left his only kid even hunger seemed no big deal for him. Mary burst into tears as she watched her father leaving her with unspecific return dates. Out of Mary’s knowledge, the long lost Esther searched Jem and she found him to tell everything she wished him to protect Mary in the name of friendship. She told him what she knew about the encounter between Mary and Harry Carson. She thought Mary loved Harry Carson. She wanted Jem to ensure that Harry Carson would not play with the girl’s heart and would marry her one day. Despite his jealousy, Jem agreed to her advice. Later, he asked for Esther’s on her super long dissipation. She explained she got married with a soldier but then was left with a kid. She abandoned the kid for having no money to support her own life. She turned into a prostitute, heavy drunkard. The goal of meeting Jem that night was to rescue Mary from potentially making the same mistake she had done. Not long after the concourse, Jem stopped Harry Carson. He directly stated what he expected to utter, bearing in his mind that Mary fell into the guy. On the contrary, Harry thought Mary set her heart for Jem only. What was initially a smooth conversation slowly turned into a fighting that prompted policemen to have separated them both. Jem was released while Harry returned home safely. Will Wilson, Jem’s cousin, came home after his long sailing abroad. How happy old Alice to have finally met her stepson! Will, Mary, Job Leigh and Margaret easily formed closeness even Will fell in love with the blind Margaret. Harry was the only son of Mr John Carson, the one the latter adored and made him proud of. So when the policemen came to his house bringing Harry’s corpse, Mr John Carson was really shattered. The corpse lied unburied for several days. While Mr John Carson and his several daughters were left broken yet remained tough, his mother acted like a kid. She thought that her most beloved son was not dead but was absorbed in his deep slumber. Mr John Carson offered a huge sum of money for the policemen to catch the murderer. It seemed easy for the officers to point their fingers. By referring to previous confrontation scene between Jem and Harry Carson, gaining confession from Jem’s mother on the gun used to shoot Harry Carson, the officer arrested Jem while he was on the job. He was transported to Liverpool to stand for a trial. Mary learned the news about Jem when she arrived at her working place, finding her fellow mates talked about her alleged role in the killing. Apart from being confused on how Jem knew her story with Harry Carson, Mary launched her alibi to set Jem free. While she was fully occupied with the bad news, Esther approached her house to hand out her finding after she had checked the murder spot. After so many years in the search, Esther’s presence in the night came as a quite shock for Mary. They behaved a bit awkward for Mary remained a bit dissapointed to her aunt although she remained polite and nice to Esther. On the other hand, Esther couldn’t let all the past go. The fact that she made the Bartons family to have suffered for her past dissipation, her recent condition as a sexual worker and heavy drunkard caused her to not easily develop smooth, intimate conversation with her beloved niece after years of living in separate lives. Esther made it short as Mary, on the other, kept all her mind for Jem. She handed the paper which contained Mary’s address to the girl. She lied about her recent conditions then they parted. One meeting seemed inadequate to fix the broken relationship, though. Mary disbelieved on what she received. She immediately knew who the murderer was: her own father. The paper belonged to her father. It was the same with the paper where she copied a poem as given by Jem on Valentine’s day. She was then torn apart of between rescuing her lover or her father. This bitter fact somehow prompted her to start her investigation. She wanted to save Jem. Although her initiatives was welcomed with rejection by Job while Margaret was crestfallen with Mary’s giddy flirting to Harry Carson, Mary went on her own way, somehow. She decided to seek Will, whom was seen to have been with Jem on the night the killing took place. Job, then, hired a lawyer. It took hard attempts for Mary to seek Will for the ship he was sailing with departed from Liverpool when she arrived in the city. With the help of the son of the landlord where which Will stayed, Mary made it possible to catch the ship after she had paid some amount of money to local sailors. Even if after Mary was able to convey her intention via the sailors as the boat she was on was approaching the ship, Will’s certainty to appear before the court remained uncertain. Mary was then helped by one of the sailors who understood her hopelessness regarding the fate of Jem. She spent the night before the trial at his home. Jem’s mother was the first to testify in the trial. She said the truth about the gun which somehow weighed down Jem’s position in the case. Then Mary. She told her feelings that she loved Jem so dearly and that her relationship with the late Harry Carson meant nothing for her but not for the rich guy. Yet, her testimony did help much to save Jem from the death penalty until Will made his harsh way to the court. As Mary expected, Will’s confession made the difference. Jem then walked free. Not everything seemed clear for Jem even if after he was released and declared innocent. Mary fell terribly sick. Not only that, Jem was torn between her and her mother who seemed reluctant to let her only son divide his attention to the girl whom he really loved. Job suggested Jem to opt her mother given her old age. Jem followed his advice. When he got home, Alice got much worse due to stroke. After she passed away Jem told her mother about his intention of marrying Mary. It didn’t take a lengthy time to persuade his mother for she gave her blessings afterwards. When Jem and Mary reconciled, agreed on their marriage plan, John Barton showed up. He was so lost, looked disturbed all the time. He didn’t even care on the arrival of Mary. Shortly after his homecoming, John Carson was invited to the house. John admitted his wrongdoing; that he was the one John Carson was looking for all the time. The burden of the labour issues wholly ruined John Barton’s mind that he didn’t understand what he had done to Harry Carson. Jem, meanwhile, knew that John Barton killed Harry Carson because John Barton borrowed the gun a few days before the crime occurred. On his deathbed, John Carson forgave John Barton and the latter died peacefully. Jem and Mary tied the knot shortly before they and Jem’s mother departed to Canada. Esther was discovered before their leaving then she died in the eyes of those she was longing for meeting. The couple was blessed with two kids. They lived happily in the land that was so far away from their hometown. Despite their distance, the new family remained close to the Job and Margaret. The letter informing that Margaret had her eyes operated brought most cheerful news to them as well as the joyous end to this very beautiful, touchy, sentimental and best of all, completed story of human beings by the great Elizabeth Gaskell.